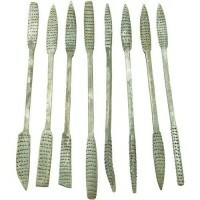 These double-ended 8-piece sets in fine cut teeth have curved tips in a variety of shapes and profiles. These 7-1/2″ fine rasps feature the same unique profile on each end. Perfect for wood carvers and restoration specialists. 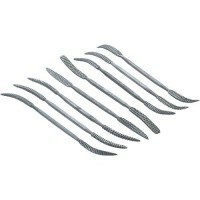 For carving and working around tight areas, this Riffler Rasp Set features eight double-ended profiles for just about any shaping and profiling requirement. Aggressive tooth cut removes wood fast and efficiently. Every woodworker needs a set of these. 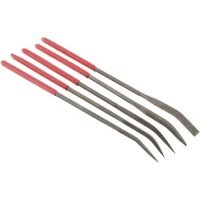 These Curved Needle Nose File Sets with five different tip profiles are ideal for extremely fine shaping. These mini extra fine files measure 5-1/2″ long with 1/8″ shanks.